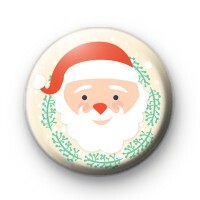 A cute father Christmas badge in a creamy brown colour featuring a really cute Santa Claus illustration surrounded by sprigs of mistletoe. We have a great range of father Christmas badges and Santa Claus badges available in our Christmas badge category along with a whole host of other Xmas badges. These badges look great pinned to your clothes during the festive period, but they can also be used in your gift wrapping and Christmas card making, or to decorate Christmas stockings. Our Christmas badges also make great stocking fillers. Standard 25mm badge made by hand in our Uk workshop.